Advidi Video, Mobile, Banner advertising network details. Advidi is a performance marketing network that focuses on their customers' success. With a seven years experience in the industry, Advidi has become a well-known name and has constantly adapted and improved. Their main focus is to partner in long-term relations with their clients in order to achieve their goals. Advidi offers multiple services and products and the most significant is the Affiliate Marketing program. 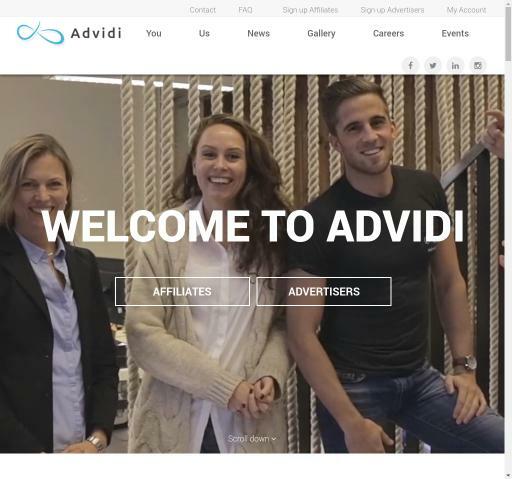 Whether you choose to be an affiliate or advertiser, you will always stay one step ahead with Advidi. Their Business Intelligence team is dedicated to get real-time stats and reports in order to make future decisions. Check the reviews of Advidi on Affbank and the Information section to find out what Pricing Models they have, their Advertising Formats and Targeting Options. Don't forget to get back on Affbank in order to leave your review about Advidi.